Barn wood is rustic, rough and gritty. It gives an earthy, grounded look to furniture and trim. 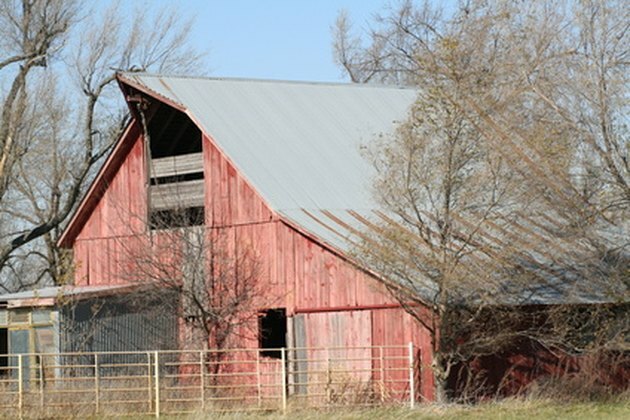 In recent years, a growing number of traditional wooden barns have been replaced with metal structures, making wood barns scarce and aged barn wood harder to find. By replicating some of the elements of the natural weathering process, you can create faux barn wood from new stock that you pick up from your local lumber yard. The look of old barn wood can be created with common tools and supplies. Choose wood with an open grain and rough texture. Rough cedar works well and is readily available in fence pickets and boards for outside trim. Lay your wood out on a pair of saw horses or another sturdy work surface. Place a piece of steel wool in a jar with a cup of white vinegar, and cover the jar with a lid. Leave the vinegar and steel covered for one day. Keep your head back when opening the lid; the fumes can be quite powerful. Apply the vinegar solution to the surface of the wood with a paint brush. This will result in a graying effect similar to sun bleaching. Apply the solution to all of the faces of the wood that will be exposed in the finished product. Allow it to dry. Dry-brush on a streaky coat of latex paint in your choice of colors -- red, blue, green and white in muted shades work well. Use flat paint for best results. Wipe most of the paint from the surface with a rag while it is still wet. Allow the remaining paint to dry. Beat the wood with a chain, ball peen hammer or other heavy, blunt object to give it added texture. Stab the surface of the wood with a wood chisel in random spots. Drive large nails into the surface of the board and pull them out to create the appearance of nail holes and tool marks. Sand the entire surface of the board with a belt sander and an 80 grit belt. Go over the entire board with one light pass and scuff up edges and ends. Do not try to sand out any of the texture marks you added. This step is to remove more of the paint. Apply a final coat of the vinegar aging solution, and allow it to dry.